Ramaphosa confident peace will be restored in SADC countries - SABC News - Breaking news, special reports, world, business, sport coverage of all South African current events. Africa's news leader. Presidents Ramaphosa and Kabila discussed "the evolution of the political, electoral and security situations in the DRC". President Cyril Ramaphosa says he’s confident that peace, security and stability will be restored in all countries within SADC Region. He is in Kinshasa, Democratic Republic of the Congo, for a working visit, holding meetings with his counterpart, Joseph Kabila. The two leaders are discussing bilateral cooperation as well as political and security developments in the region and continent. The DRC is heading to the polls in December and there are mounting fears of instability and uncertainty. President Ramaphosa on Friday praised Joseph Kabila, the outgoing DR Congo head of state, for his “respect for the constitution”, according to a statement. Kabila on Wednesday ended months of speculation by putting his weight behind former interior minister Emmanuel Ramazani Shadary to be his successor for the December 23 poll. 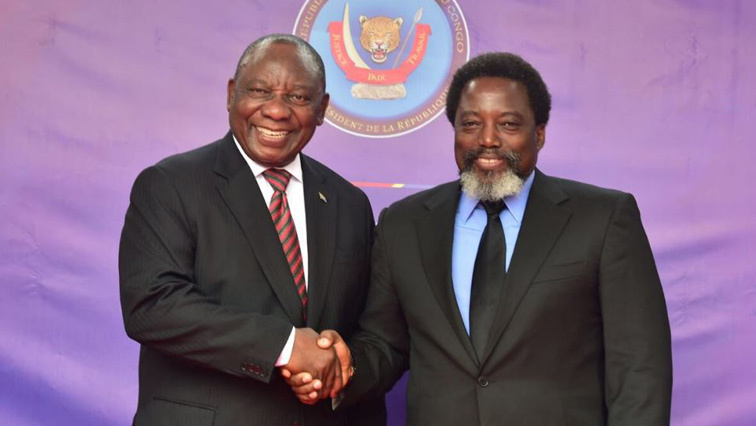 Ramaphosa and Kabila discussed “the evolution of the political, electoral and security situations in the DRC as well as the strengthening of relations between the two countries and issues of regional interest,” a joint statement said. They also recognised the “significant progress made in the electoral process” in the war-torn country Kabila has ruled for 17 years. Ramaphosa, who is also the current head of the Southern African Development Community (SADC), praised his counterpart for “honouring his word to respect the constitution” of the DR Congo, the statement added. Meanwhile, supporters of opposition leader Moise Katumbi, who has been barred from entering the country to contest the election, said on Friday they had appealed to a top court. “We have gone to the Council of State to obtain the immediate lifting of this irregular measure”, Delly Sesanga of Katumbi’s Ensemble (Together) coalition told media. Katumbi was refused entry last week as he tried to get home via Zambia before a deadline to submit his candidacy for the presidential polls. The wealthy businessman and former governor of the province of Katanga has been living in self-imposed exile in Belgium since May 2016 after falling out with Kabila. A country of some 80 million people, the Democratic Republic of Congo has never known a peaceful government transition since it gained independence from Belgium in 1960. Kabila’s tenure over the vast mineral-rich country has been marked by a reputation for corruption, inequality and unrest. This entry was posted on 10 Aug 2018,10:18PM at 10:18 PM and is filed under Africa, News, Homepage Featured Story Slider. You can follow any responses to this entry through the RSS 2.0 feed. Both comments and pings are currently closed.